"Castlevania: Portrait of Ruin, known in Japan as Akumajō Dracula: Gallery of Labyrinth (悪魔城ドラキュラ ギャラリー・オブ・ラビリンス?, lit. "Devil's Castle Dracula: Gallery of Labyrinth"), is an action video game developed and published by Konami. The game was released on November 16, 2006 in Japan, and in the US on December 5, 2006 for the Nintendo DS handheld game console. 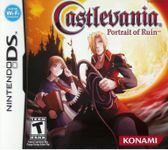 Portrait of Ruin is the first Castlevania to feature a cooperative multiplayer gameplay mode and the first handheld Castlevania to have English voice-overs. Portrait of Ruin is set in 1944 Europe during World War II, and is a continuation of the story from Castlevania: Bloodlines. The game introduces new protagonists and antagonists to the Castlevania series as well as expand on the two character gameplay found in the previous Nintendo DS Castlevania title, Castlevania: Dawn of Sorrow. Portrait of Ruin has met with an overall positive critical response and has received high ratings from reviews, along with several awards." Source: Wikipedia, "Castlevania:_Portrait_of_Ruin," available under the CC-BY-SA License.